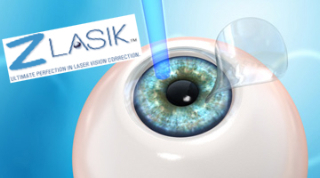 LASIK (laser assisted in-situ keratomileusis) is the most commonly performed and well known vision correction surgery. Using an excimer laser, the doctor re-shapes the cornea (the stationary refractive element at the front of the eye) so that images are focused to the correct spot on the retina (the light receptor of the eye). The success rate with this procedure is excellent, with most patients achieving 20/20 vision or better upon completion. The LASIK procedure itself involves little or no discomfort (or pain) both during the procedure and through the recovery process. Also, eyesight improvement is almost immediate, and maximum vision is typically achieved within a few days. Desire to decrease or eliminate dependence on glasses or contacts. During the procedure, the doctor first administers a local anesthetic via eye drops, so the patient will feel no pain during the surgery. A speculum is then placed over the eye to prevent the patient from blinking. Next, the surgeon cuts an extremely thin flap from the outer layer of the cornea, using femtosecond Laser (bladeless, all-Laser LASIK, or zLASIK), instead of a cutting device with a blade to perform the first stage of the LASIK procedure. The femtosecond laser works by firing minuscule pulses into a specific area in the cornea. These pulses expand and in the process separate the cornea in a very precise and reproducible manner. This level of precision enables surgeon to create thin flaps. Thin flap Lasik, also known as Sub-Bowman's Keratomileusis (SBK), has been demonstrated to produce improved outcomes and has been approved for use in US fighter pilots and NASA astronauts. The flap is folded to the side, and the excimer laser, programmed with the individual map of the patient’s eye (Wave-front Guided treatment & Iris Registration), removes excess tissue with quick pulses of concentrated light. This process usually takes less than a minute. Once this is done, the doctor folds the flap back into place and surgery is complete. The patient may go home shortly after the procedure; however, someone else must drive or alternate transportation must be arranged. Patients will be asked to get lots of rest, avoid any strenuous activities, and avoid rubbing the eye area for a period of time. There are follow up appointments with the doctor 24 to 48 hours after the procedure and periodically over the following weeks and months. Vision should dramatically improve in the first few days following surgery. The patient often may return to work in a day or two, though it is best to take a few days off to ensure a smooth recovery. If you have any questions or comments, please call the office or use the contact form below. I had worn glasses from my early teens, but had never been comfortable with them. I switched to contact lenses in my late twenties, when I could no longer see the far end of a football pitch clearly towards the end of games in the late Autumn and Winter! I was always quite comfortable with contact lenses, but by last year, I was struggling even with my these, as I was at that stage when bifocal vision was plaguing me. I was prescribed varifocal glasses, but just couldn’t get on with them – I seemed always to be looking through the wrong part of the lens! So, it was time to look at an alternative, so I had a consultation with Mr Habib. I was assured that I was a ‘suitable case for treatment’, but it was pointed out to me that with astigmatism in both eyes, and varifocals now the order of the day, I might need reading glasses and glasses to drive at night, following surgery, should I go ahead with it. However, with the prospect of being free of both glasses and contact lenses, for probably 90% of the time, for the first time in something like 40 years, I decided it was worth going ahead. Surgery took place in mid July. I was looked after superbly on arrival (and at al times throughout the morning) at the Nuffield Hospital in Plymouth - probably far more fuss than I needed, in fact! – and was taken down for surgery, where I was offered music if I wanted it, and looked after by the nursing staff, whilst Mr Habib prepared. Every aspect of the procedure was explained to me, and I was made to feel very relaxed and completely ready for what was to follow. Except that it was all over in a few minutes, and once again I was left wondering what all the fuss was about! Furthermore, as soon as I sat up, I was able to see clearly, without glasses or contact lenses, for the first time for as long as I could remember. Fantastic. The after care was just as good, with a follow up consultation with Mt Habib 24 hours, then 1 week, later. Initially, I was finding that I felt I needed reading glasses to help at times, but after a few weeks I found myself no longer needing them – thankfully, Mr Habib had told me to just buy some ‘off the shelf’ reading glasses, at the lowest prescription I could find. Even so, some 4 months later, these now seem like a waste of money! My next follow-up consultation took place after 3 months, at which appointment Mr Habib assured me I had better than 20 / 20 vision – I could read much, much smaller letters on the test chart than I ever thought possible, bottom line and beyond! – and that my eyes were in good shape and everything was looking great. Of course, everything is looking great as far as I am concerned – waking up in the morning and being able to see ‘normally’ for what seems like the first time in my life; being able to really enjoy scenery when out walking; being able to read traffic signs, notices, shop window displays, all things which people with regular sight take for granted, but which had long been a source of frustration for me. It seems churlish to describe it as ‘life changing’ when ‘all’ I have done is rid myself of glasses and contact lenses, but like so many things, unless you have experienced it, it is hard to describe what a difference it makes. Do I have any regrets about the surgery? Yes – I wish I had done it years ago! My recent cataract operation was a short painless procedure, done in a relaxed atmosphere. Prior to surgery, my unusual cataract had grown rapidly over a few months reducing my vision to a near sighted blur. The outcome has been beyond my expectations, as I now have my clear vision restored.